Welcome 2019! I hope this year brings you happiness and good health. We are getting right back into our routine. In reading we are still working on reading non fiction. We will be working on written responses in non fiction this week. Check out Mrs. Barse's blog to see what is happening in math. It's been a busy week. We had picture day on Tuesday, a Fire Prevention assembly on Wednesday, and met with our first grade buddies on Thursday. Next week there is a half day for students on Wednesday, Oct. 17. Conferences are the week after on Oct. 24 and 25th. Our readers have been doing deep dives into their characters. They are learning to use patterns of character behavior, character relationships, as well as what the character says, does, and thinks to develop theories about them. One question we ask about our character is "why are they doing that?" We do this to get to the heart of what motivates our characters. We have also been writing about our reading and using text evidence to support our thinking. This is a large part of fourth grade reading. Students need to develop ideas about their characters and defend them with specific evidence from the text. 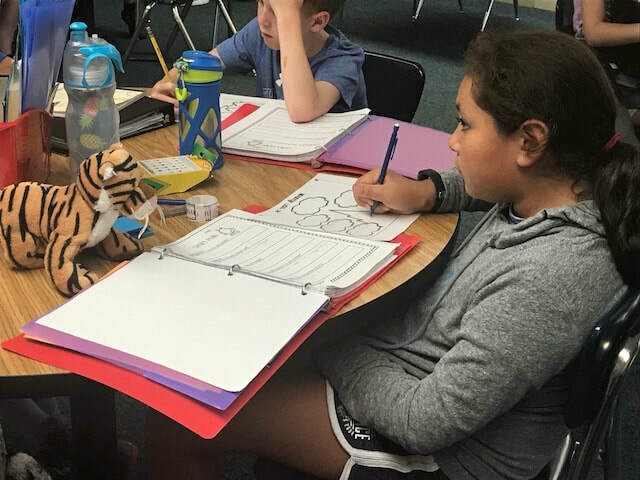 Gabby's tiger helps her plan her story. Today was our fund raiser for the Jimmy Fund. 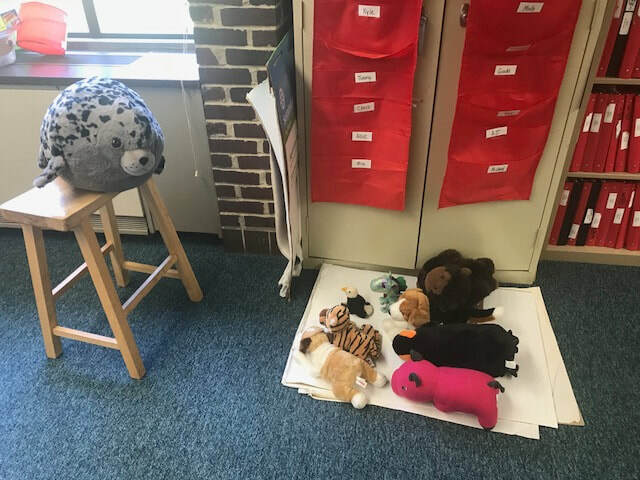 Students were allowed to bring stuffed animals to school today. Here are our critters having their own class session while the students are off at library. We have been very busy in our first full week of school We wrapped up our unit on reading signposts this week. We covered Words of the Wiser, Again and Again, and Memory moments. Below is an explanation of these. Words of the Wiser - when a character gets life advice from another character, usually an older, wiser character. This can point to the theme in the book. Again and Again - this is when an author repeats a word, phrase, or image over and over again. Readers need to notice that and ask, "Why is the author doing this?" Memory Moment - these are flashbacks in a book when the character is remembering something that happened. Readers need to ask, "How is this important to the story?" Contrasts and Contradictions - We notice this when a character acts in an unexpected way. Either contrary to their personality or contrary to what we might do in that situation. When we notice this, we jot down what they did (this is the notice part) and then we ask, "Why did they do that?" We answer this question below where we noticed the contradiction, (this is the note part). Aha Moment - This is when a character realizes something important or has a light bulb moment. Again, we notice it by writing down what they realized and note by asking answering, "How will this change things?" Tough Questions - Sometimes in a story, a character will ask a question that isn't easily answered. They might ask themselves this question or someone else. For example, in the book Fly Away Home, the young boy asks, "Why don't we have a home?" When we see this, we need to notice it and ask, "What does this reveal about the character's inner struggle?" We are off to a great start in Room 2! This is a wonderful class and I am enjoying getting to know everyone. We have spent a lot of time in the first few days of school reviewing Growth Mindset. If you check out the link above you will find more information about Growth Mindset and links to some videos. Ask your fourth grader about neuroplasticity! Check back here throughout the year to see what our class is doing. Find pictures of assemblies and class activities as well as information about what is going on in reading. Let's hope the warmer weather is here to stay. As much as I enjoy skiing, I am ready for some warmth without having to wear wool socks and 4 layers. Be sure to check out the list of events on the home page. There are many things going on this Spring. With all the snow days, we have lost some valuable instructional time. We are working hard to make up and catch up from that lost time. This week brings 3 assessments to our fourth graders. They will need to write an information essay using research from Social Studies. I will be looking at their ability to apply all the skills they have learned this year about expository writing such as elaborating with a variety of evidence, using transition words, and writing like an expert. They will also take the DRP in reading this week. This is an assessment of how well a reader can make meaning from what they are reading. by filling in missing words in nonfiction passages. On Friday, they will have a math test on angles. They will have to measure and draw angles as well as identifying right, obtuse, and acute angles. It seems that March is coming in like a lion with multiple storms to start out the month. I am hoping for a quieter second half of March. We have been working hard leaning how to write short responses to reading comprehension questions. This is an important skill as students will be asked to do this throughout their academic career. We have put emphasis on providing specific details from the text to support their thinking. Next week, we will begin another nonfiction unit. *Disclaimer: (as required by RSD 17 policy 4118.5/4218.5) Haddam-Killingworth Regional School District 17 is not responsible for the content of messages posted on this webpage.